Welcome to the City of Rockville, where granite is the heart of our city and our beautiful lakes replenish our soul! The City of Rockville is a relatively “new” city as the old City of Rockville merged with Rockville Township and the City of Pleasant Lake in 2002. The City is poised to take on the challenges and opportunities that this new, larger city offers. Whether you’re looking for a place to visit, live or do business, you’ll find that Rockville just may be the spot for you. Visit – We have four lakes within city limits for recreation, a variety of businesses, parks, and more. Live - We offer a quiet, rural but growing community to raise a family. Rockville is part of the Rocori and St. Cloud school districts, which offers top-notch education for our children. Business – Rockville has more than 100 very diversified businesses, with a slight tip of the scale towards agriculture and granite manufacturing industries. I am proud of the fact that Rockville is moving forward in planning for our future and including residents in that planning. Scheduled for completion in 2004 is an updated Comprehensive Plan. Also scheduled for completion is the sanitary sewer project around Grand and Pleasant lakes. The system will connect into Cold Spring’s wastewater treatment plant. 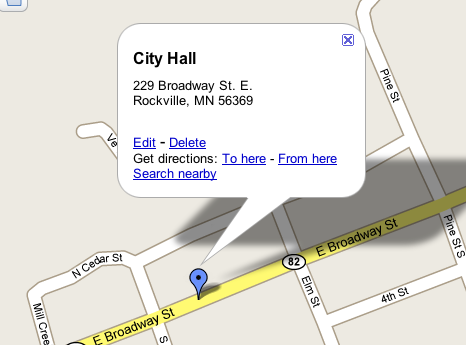 We look forward to assisting you – any questions about the city can be directed to City Hall at (320) 251-5836.